Of course I get California plates on my rental. For this past weekend, I flew out to Salt Lake City on Saturday evening and returned Tuesday morning. 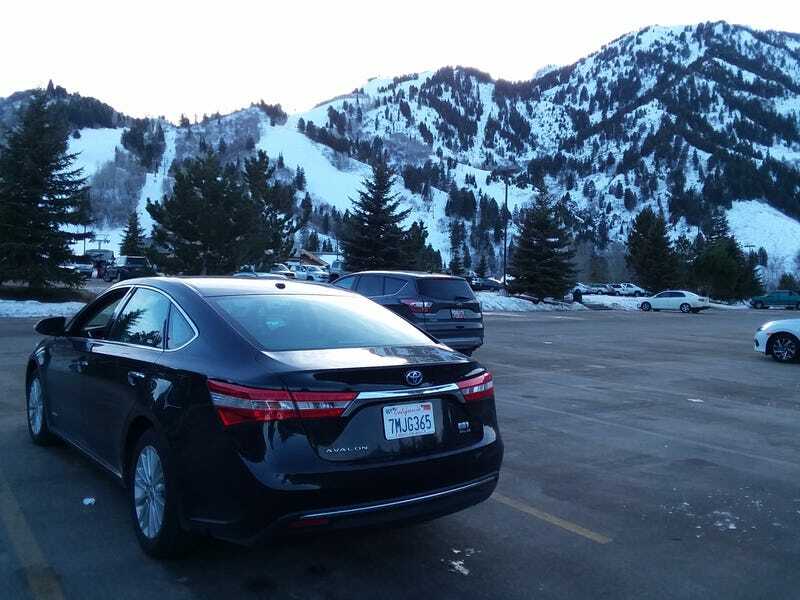 A short trip for two days of skiing at Snowbasin. While there wasn’t a TON of snow on the mountain, the terrain was great and I was able to find good snow in plenty of places. For my rental car, I went to Fox which was a terrible ordeal. But since it worked out and I was upgraded to a “luxury” car I guess I cannot complain too much. I wont ever rent from them again though since a reservation does not mean you are guaranteed a car!! Anyways, the Toyota Avalon Hybrid was a comfortable highway cruiser and I really had no complaints about it. It accelerated when I told it to, it turned acceptably, and contained all of my gear without issue. Now I saw “without issue” only because I had no passengers. Thanks to the hybrid crap, there is no foldown or pass through rear seat. So my skis took up the passenger side of the car with the seat leaned back. While you could still easily fit another person behind the driver with ease, this was not convenient for how big the car is. The rest of my crap easily fit in the cavernous trunk. Infotainment worked flawlessly. I just had my phone connected via bluetooth and had no troubles. The buttons seemed intuitive and my favorite part was the giant volume knob. Climate controls also worked easily and did their job. The only electronic thing that annoyed me was the traction control button was all but useless. As soon as the tires spun, the traction control would turn back on and ruin the fun. What is the point of the button if you cant actually use it?? It also could only be disabled when not in motion. While nobody in their right mind is going to hoon an Avalon, I find defeating the traction control important for dealing with winter weather. And aside from the car, Utah seems to be a pretty cool place. I did not get to see much of Salt Lake City since I arrived and left in the dark in a hurry. But the mountain was beautiful and the snow quality was pretty good, even though they have been lacking decent snowfall this year. It was better than an average day in Vermont so I was happy as can be. Bluebird skies both days, highs reached nearly 40F! Some decent stuff up top. Views were spectacular and in the right sunlight, the snow was very good despite the thin cover.